There are many different finishing technique in jewelry making. This how-to sliding bead finishing technique is one of the easiest for finishing a thong piece of jewelry - be it for necklace, bracelet, or anklet. A few choice beads strung on a leather cord can be quite dramatic and yet is one of the most basic jewelry pieces. Add extra length to your thong if you are going to knot between beads. Get a piece of thong long enough to, at minimum, go over your head (if you are making a necklace). String your chosen beads. (You can knot between the beads if you like). String on your sliding bead - a bead that has a hole large enough to string both ends of your thong through. It also has to strong and fit tightly around the 2 strands of your thonging material. 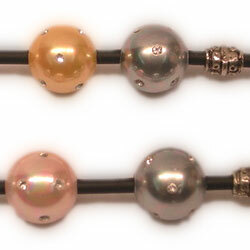 The key element to finishing with sliding beads is that your chosen sliding bead's hole has to be large enough to be strung on both strands of your thong and you can slide the bead along (to lengthen/shorten your necklace) but small enough so that the sliding bead will stay in place when you have positioned it. To prevent you sliding bead from slipping off all together, tie both ends of your thong together. That's it - the simplest finsihing technique with sliding beads!